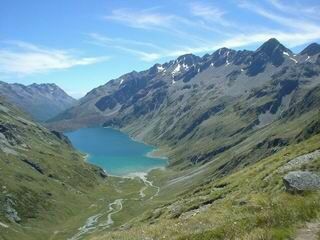 Section J-1 enters the Nelson Lakes National Park and follows the spectacular Travers and Sabine River valleys, with a crossing of Travers Saddle in between, before continuing south over challenging Waiau Pass. The route over Waiau Pass, at elevation 1870 meters (6100 feet) the highest point reached on the whole trek, is extremely rugged, going straight up a 32-degree rock-scree field for 400 meters (1300 feet) of elevation gain, and then descending down a few category-3 (or even 4) rock climbs, down steep tussock and rock fields, and finally along vague overgrown bush tracks to reach the head of the Waiau River valley. The route over the pass is marked by poles and worn into the dirt and rock by previous trampers, but is not an established or formed track. 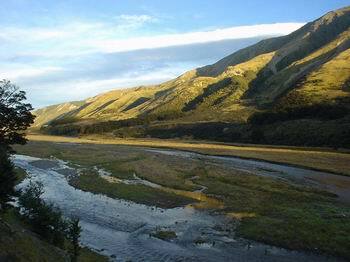 After Waiau Pass, the route follows down the Waiau River valley, entering extensive grassy "cattle flats" along the river before joining with the St. James Walkway, for more walking along cattle flats to Boyle Village at Lewis Pass. Section J-1, 140 km from St. Arnaud to Lewis Pass, was definitely the most beautiful and also most challenging part of the trek so far. (See the pictures; they turned out wonderfully.) This section seemed to require all the skills and experience I had acquired earlier in the trek and elsewhere, including psychological ease with high alpine terrain (from many such sections on the Pacific Crest Trail in the U.S.), whole-body climbing and descending skills (including downclimbing backwards with feet probing for footholds), ability to follow a poorly marked, indistinct and/or overgrown track/route, care and patience needed to cross slippery boulder fields and steep descents, judgments about the best places to repeatedly cross rivers and skills for doing so safely, recognition of the appropriate times to stow my poles on my pack to free my hands, and the boldness to walk through herds of grazing steers with the expectation that they would turn and run (they always did!). My energy remained high and my patience was in good supply. 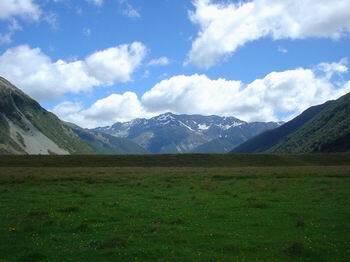 The timing was good, in terms of the weather crossing Waiau Pass and meeting other trampers who could offer advice. Indeed, this section seemed to be saying philosophically that "life is mostly about timing, patience, and paying attention; everything else will take care of itself." 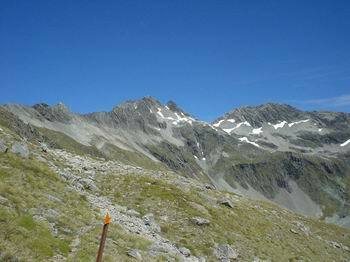 My life was literally on the line with each step across Waiau Pass but it didn't bother me. I took my time and was very careful and conscious with each and every step all day long. Any disabling injury near the top could be fatal, as it would be hard to get down to water, and rescue before dehydration and/or exposure set in could be quite uncertain due to weather and other delays, even with the emergency satellite beacon (EPIRB) I carried and an extensive set of warm clothing. 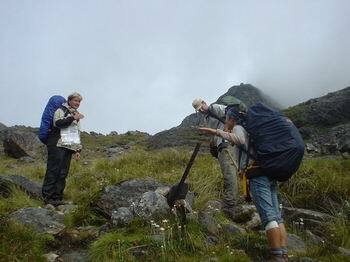 The pass is very isolated and time-consuming to reach due to the rugged terrain getting to it from either side. I would not do it again alone. No sobs of relief at the end, just a sense of awe that somehow it was all possible without mishap, and a sense of satisfaction at going over. Section J starts at St. Arnaud, following the Lakeside Track along Lake Rotoiti. The water taxi shown here ferries many trampers to the far end of the lake, saving 9 km, but I hiked this bit. Robbie and Stan, two of four hiking companions the first day. After taking the water taxi, they caught up to me midday, and I stayed with them the rest of the day up the Travers River valley to Upper Travers Hut. Thanks for a great day, guys. I couldn't have made it that far without you to follow! Day One. 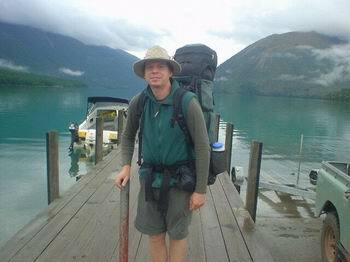 Set out from St. Arnaud at 8 am and was making good progress when it started to rain. Hmmmm...perhaps I'll only go to John Tait Hut today, I thought. Then along come four trampers behind me, looking very fit and moving fast. Three were Americans (believe it or not, among the first Americans I can remember meeting along my trek), and one was a New Zealander living abroad. I decided to hike with them, and had to markedly increase my pace to do so. Usually I hike slowly by myself, but can match someone's pace without much trouble. 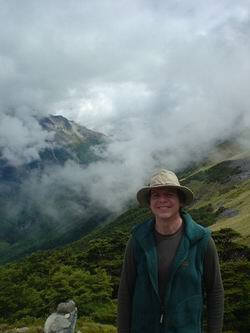 The company of other hikers was enjoyable, and by 5 pm we had reached John Tait Hut in the pouring rain. Continue to Upper Travers Hut, another 3 hours? The verdict was yes, and so off we went, reaching Upper Travers by about 8 pm, in the fading light. 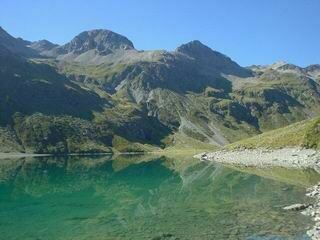 A total of 27 km from St. Arnaud that day for me. The hut was full of other trampers who had stayed inside that day, rather than attempting to go over Travers Saddle (my destination also). So a logistical problem that had prevented me from leaving the day before turned out to be an non-issue, as I would have been holed up inside the hut that day anyway, waiting to go over the saddle with everyone else. 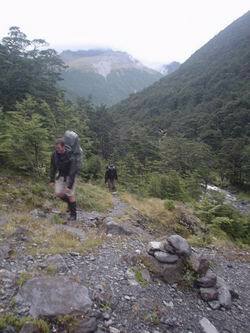 The first day up the Travers River was mostly hiked in the cold rain. A Gortex parka and gaitors keep me warm enough on the vigourous ascent up the valley. Upper Travers Hut was reached just at dusk after a long first day, 27 km uphill in 12 hours on the track. 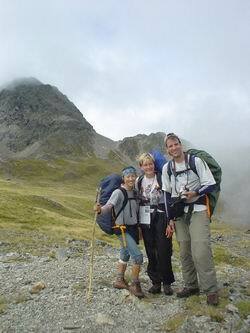 On the day over Travers Saddle, my hiking companions were Jose and Jan from Holland, and Jin-Young from Korea. A great day! Day Two. The weather the next day looked promising, and the earlier people in the hut set out over the saddle early. I joined a slightly later group, Jose and Jan, a Dutch couple, and Jin-Young, a Korean woman. Once again, it was really nice to hike with some other people. We made steady progress up to the top of Travers Saddle and then down the other side to West Sabine Hut by 4 pm. I considered continuing on to Blue Lake, another 3-4 hours, but was too beat and West Sabine Hut was quite inviting. The tracks, although allowing for some nice aerobic striding, still contained a significant amount of "strength" or "whole-body" hiking. 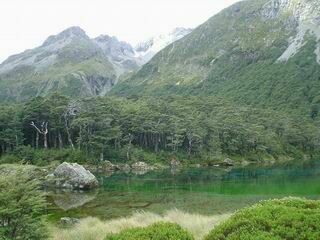 Anyway, getting to Blue Lake in two very strenuous days would not have been worthwhile, as I realized I needed to be well rested and in good shape for the challenging full day from Blue Lake up and over the Waiau Pass. 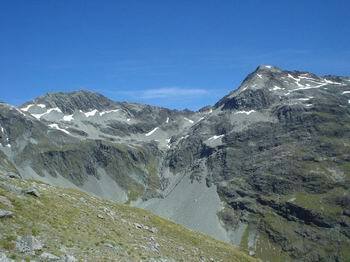 So I shouldn't attempt Waiau Pass on the third day even if I did make it to Blue Lake on day two; fatigue and inattention over the pass could be deadly. Day Three. I hiked four hours (slowly) to Blue Lake Hut and rested and ate well all afternoon, to prepare myself for the route over Waiau. 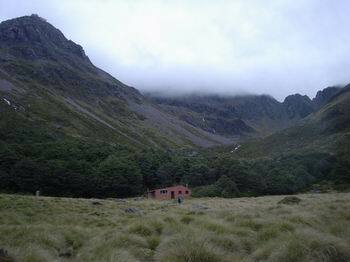 That evening, four kiwis arrived at Blue Lake Hut who had just come over Waiau Pass in the other direction (Bruce, Phil, and Nick from Christchurch and Piers from Rangiore). It was rare to find such people, as Waiau Pass is not traveled much, perhaps one party per week it seemed. 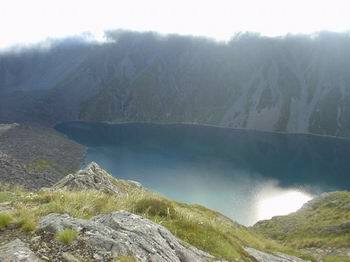 "The hardest tramping day I've ever had" said one. (They had come all the way from Caroline Hut that day, longer than my planned day over the pass, as I was going to camp once down the other side rather than continue an additional tough 3-4 hours to the hut.) An inscribed photo of the pass on the wall of Blue Lake Hut showed the route going apparently straight up the side of the mountain, up a scree field that looked like 70 degrees of slope! "You're going up that?" another kiwi tramper present asked, pointing to the picture. Well, I guess so. Waiau Pass is one of only two ways to get through to Lewis Pass, and the other way is even harder. The four who had come over Waiau that day told me a bit about the Waiau route and it was all very helpful, so once again timing here was good. There was no snow on the route itself. "Don't worry about the scree" said one, "it remains at a constant 32 degrees (slope) and you can't slide down it; you just don't get anywhere sometimes" (i.e., two steps forward and one step back). That allowed me to go over the scree with confidence, rather than anxiety at sliding downhill. Most importantly, they convinced me it wasn't dangerous and there were no steep drop-offs to negotiate. This "exposure" to steep drops-offs is what bothers me the most on rocky routes, and I was much relieved that I wouldn't have to face that issue on Waiau (was true). Finally, they told me "you can do it." Thanks, guys! Day Four. Up and over Waiau Pass. This route is not for those of less determined bent, and I wouldn't do it alone again. 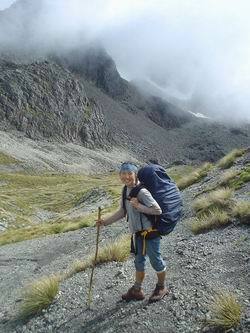 In fact, Te Araroa planners have real nerve including it in the Te Araroa route, even if it is still the only way to get from St. Arnaud south to Lewis Pass. The route is poled and reasonably well marked but doesn't offer much of a formed track. After climbing high above Lake Constance and then steeply descending again, with an uncomfortable traverse around the steep side of a gully to get around steep rocks in a stream bed (one of the worst parts of the route), the route returned far down to the lake shore. Then it was time for the main climb: 400 m of vertical ascent up a steep rock scree field, another traverse, and then a final 200m climb to the pass. Actually, all of this climbing up wasn't too bad. The lower half of the scree field was good walking. Towards the top, sometimes I would be "walking in place" in the scree as it shifted downhill under me, sending larger rocks cascading down (but they didn't go far and always came to rest again). At the top I ate lunch and basked in having good weather. ...and #3, towards Mt. Mahanga, 2196 meters. Note the poles indicating the route. There wasn't an actual track around Lake Constance and then over and down Waiau Pass, just these poles and the indentations worn into the dirt and rock left by others who have gone before. Top of Waiau Pass, elevation 1870 meters, looking south. Was warm enough to stop and eat lunch, with a rock sheltering me from the northerly wind. 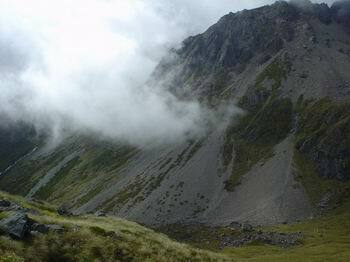 Waiau Pass will most likely be the highest point reached on my trek. Coming down was significantly more difficult. A tramping book by Sven Brabyn describes the initial descent as over "easy rocky ribs" which translated, however, to several Category-3 (or even 4?) rock downclimbs of perhaps 3-7 meters height (10-20 feet), down cracks with no obvious footholds or steps. I found it possible to get down these climbs with my pack on and with great patience and care, but did have a cord handy in case I needed to lower my pack ahead of me. I was very aware that a fall down one of these climbs could potentially be disabling. This bit, for perhaps 45 minutes, was the closest I've come to technical rock climbing and the crux of the section for me. Rain would make the rock downclimbs very dangerous. Looking up at the steep "rocky ribs" above me, I genuinely marveled at how I could have possibly come down them. 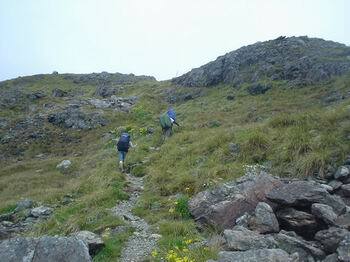 Later, the route became a steep descent over broken rock, dirt, and tussock fields. When it reached the river valley, it became a good dirt track on the ground but severely overgrown with bush, so each step had to be made while bush was pushed away and the ground felt with feet or poles for step-downs and obstacles--an extremely slow process. In all, it took about 8 hours of hiking, plus a half-hour break at the top, to go from Blue Lake Hut, elevation 1100 meters, to Waiau Pass, elevation 1870 meters, and back down to the Waiau Forks camp, elevation 1100 meters. The actual distance traveled was probably about 6-7 kilometers. Day Five. Very glad I had a tent for camping at Waiau Forks and didn't have to walk these 4 hours to Caroline Hut the day before! It started raining in the morning just as I was packing up--the weather for crossing Waiau Pass had ceased and I once again felt gratitude at the timing. 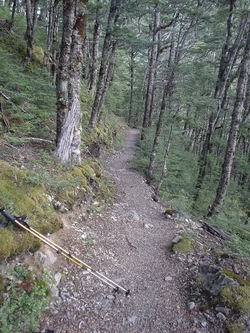 The morning hike down the valley to Caroline Hut was very slow. 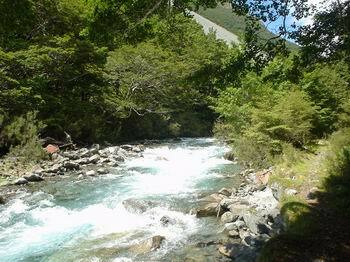 The route follows the river downstream, crossing several large boulder fields and venturing into the bush now and then. 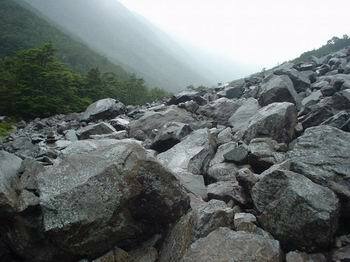 The boulder fields are leg-capturing deep and full of large sharp and irregular boulders. One step at a time, testing each foot plant as it gets made. A few cairns marked points along the way, but otherwise the route was unmarked and finding tracks through the bush was a task in itself. A painstaking 1 km/hour walk made slippery by the rain. At Caroline Hut for lunch, I realized that the next place to sleep was Anne Hut, some 8-9 hours distant, as the route then crossed the St. James cattle flats and camping was not allowed on this private property. Also, the route to Anne Hut involved several river crossings, not advisable in such heavy rain even thought the rivers were fairly gentle. So all things considered, I called it another half-day and stayed at Caroline Hut. 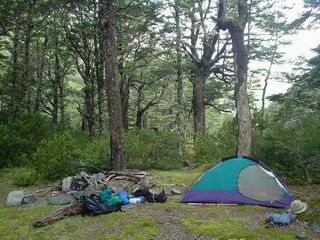 Waiau Forks Camp. Made it up, over, and down from Waiau Pass! A relief, but mostly a sense of awe -- that somehow it was all possible without mishap. Time for a much-thought-about dinner of rehydrated lamb, peas, and mashed potatoes. Travel down the Waiau River valley after Waiau Pass was at first very rugged, with numerous boulder fields like this one which needed to be crossed without a trail--just a few rock cairns (human-built piles) marking points along the way--and in pouring rain which made the rocks very slippery. 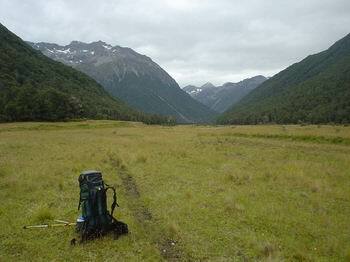 View back northward to Waiau Pass, from the Waiau River valley near Caroline Hut. The valley was populated with herds of *steers*, which turned and ran away from me every time I approached with my new-found confidence and bravado (learning from the Section G incident). Day Six. Now the steep mountain terrain and overgrown bush routes were replaced by easy walking over grassy "cattle flats" alongside the river. Nice that there were no fences anywhere to be seen--the upper forest and moutain slopes formed natural barriers and the entire valley belonged to the cattle station. It became necessary to cross the Waiau river several times to switch sides when steep forest came down to the riverbank on one side, and then later one crossing of the Ada River, but these proved quite easy and not dangerous, even enjoyable. And soon I began to encounter herds of cattle--all of them steers. (Recall my encounter with the "bulls" in Section G that were probably steers.) Newly confident about the steers from the reader feedback I received after my Section G encounter (good thing I had it), I boldly walked along the track (which later became a dirt road), with the confidence of being "the boss", expecting them to give way. And they always did--usually turning and running away. Sometimes one steer would hold his ground until the last minute, but would always run away as I kept coming forward. OK, I've learned! View up the Ada River valley from Ada Flat at the confluence of the Ada and Waiau Rivers: flat cattle grasslands surrounded by high rugged mountains make for classic South Island NZ terrain--beautiful! I hardly even noticed all the cow patties on the ground. 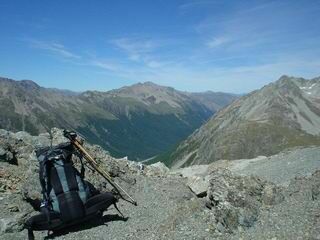 From here I joined the St. James Walkway, one of NZ's "great walks." Day Seven. 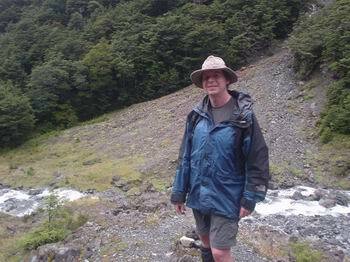 Very surprising, but I met only three people my entire day-and-a-half on the St. James Walkway, one of New Zealand's "great walks." Where was everyone? Anne Hut had room for 20 and there were three of us last night. I literally met only one single person walking on the track itself those two days. Odd. The "walkway" wasn't much different than the river flats route down the Waiau river, however, although with reasonable markings. Walking meant choosing one cattle track or another over the irregular-surface flats, with occasional forays up and down bluffs. The cattle used the St. James Walkway much more than the trampers! Finally, towards the end of the Walkway, the track went into beech forest and became a well-formed easy-to-walk track of the kind I'm most used to. Finally, after all that, an easy track! So kiwis can build easy tracks if they really want to! I even had to take a picture of the track itself. As dusk approached and I was looking for a nice campsite in the Boyle River valley, perhaps an hour short of Lewis Pass, guess what I should run into? A small group of about six bulls! Yes, these were actually bulls. They shouldn't have been there, I didn't think, as it was undisturbed grassland within Lake Sumner Forest Park and legal camping country. I behaved the same way I had with the steers, and the bulls turned and ran away also! At last! An easy track to walk, through the beech forest for the last 15 km of the St. James Walkway, after uneven valley travel through cattle pasture and a track that often seemed more like an undeveloped "route" than a "walkway"! View at sunset from my campsite overlooking the beautiful Boyle River valley, on the last day before reaching Boyle Village at Lewis Pass and the end of the St. James Walkway. The next morning, gale-force winds down the valley, followed later by pouring rain, made for a hasty departure! Day Eight. In the middle of the night gale-force winds swept down the Boyle River valley, threatening (in my mind anyway) to send me and my tent over the edge of the cliff I had camped near, overlooking the river. Either that, or the trees were going to be uprooted and topple on me. One can imagine many things when the forces of nature are let loose. Nothing happened, and by morning the wind had died down and the pouring rain started, soaking me that last hour to the road. At the road, two Italians with a small child were leisurely breakfasting on their folding table in a bus shelter they had backed their camper van up to. Breakfast finished, they were happy to give me a ride to a store in the tiny settlement of Maruia (population seemingly less than 100), which was on their planned driving route anyway. The store turned out to be closed despite "open" signs everywhere, but a bus heading back to the nearby settlement of Springs Junction came along within half an hour, during which I had a marvelous talk with the postmaster of Maruia on the side of the highway.